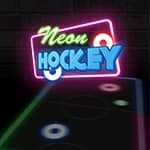 Neon Hockey is a fast and at the same time complex hockey game. Choose against whom you will play: a computer or an opponent. Three modes of complexity: easy, medium and complex. The player who first scores 3 goals wins.